Heavenly pile of puffy naan at Bull Prairie, Fremont Winema NF, near Lakeview, OR (42⁰18’03.01” N 120⁰13’57.66” W). Naan is the heavenly flatbread that goes best with goopy East Indian dishes where every drop needs to be thoroughly scooped up from the plate. What do you mean, it’s too much work and you can’t do this while camping, BS! I stole this recipe from Allrecipe.com, it works very well at home and on the road. Just allow a little prep time. Seven little naan balls sitting on the plate, waiting to rise, don’t wanna be late. At home, combine all the dry ingredients in a Ziploc bag (include the unopened yeast package and a print out of the recipe). 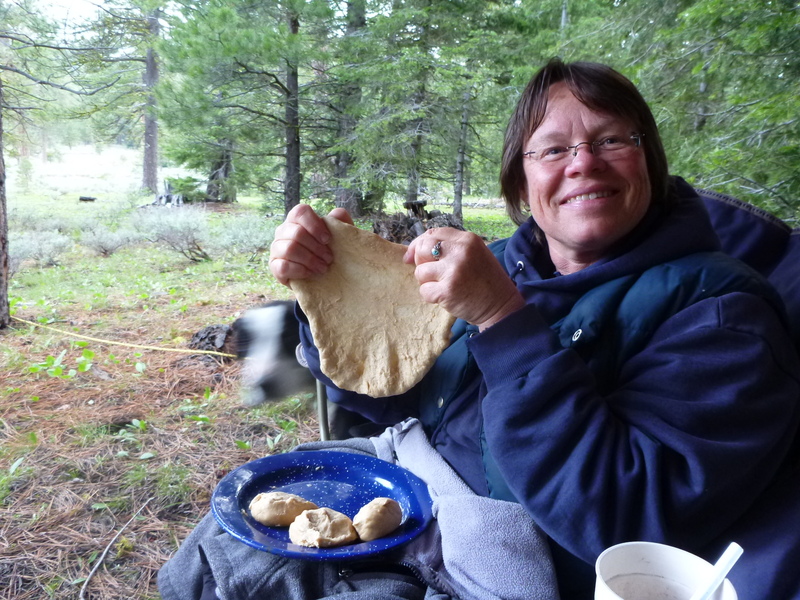 In the morning in camp (or the day before), dissolve yeast in warm water in a pot. Let stand about 10 minutes, until frothy. Stir in sugar, milk, egg, salt, garlic, and enough flour to make a soft dough (reserve some flour to sprinkle on kneading surface). Knead for 6 to 8 minutes, or until smooth. This is where the plastic tub lids come in handy, just clean them off beforehand…or leave dirty for extra flavor (just kiddin’). 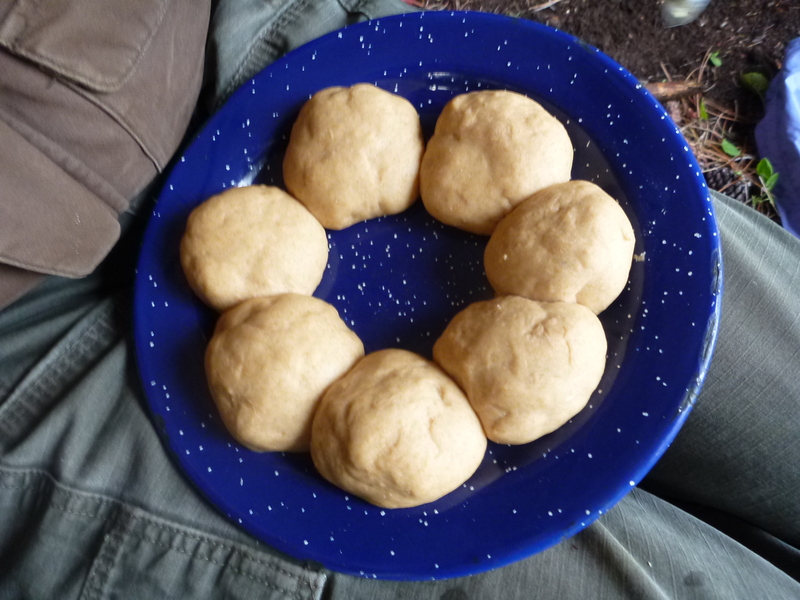 Place the dough in the oiled Ziploc that you had the dry ingredients in. You can now let it rise until doubled for an hour or better yet put it in the cooler for a slow rise. That develops the flavor, especially if you make it a day in advance. Also consider the hood, warm engine, or sunny dashboard for a rising spot, especially in the winter. Freestyle naan shaping is especially successful after a few beverages have been consumed. After the dough has risen, punch it down and pinch off small handfuls of dough about the size of a golf ball. Roll into balls, place on a plate, and allow to rise again until doubled in size, about 30 minutes. Preheat skillet, add very little oil. Shape the balls into a thin circle or whatever crazy freestyle shape may evolve, who cares, right? 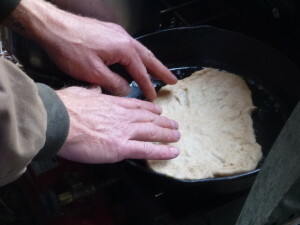 Place dough into skillet (or grill if you like), and cook for 2-3 minutes or until puffy and lightly browned. If you have some extra butter, you can brush uncooked side then flip but it’s good without it, too. The cook carefully places the perfectly shaped dough into the skillet and hopes for the best. 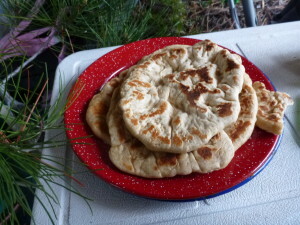 This makes a bunch of naan, how much will depend on the size that you shape them in. It’s also fun to add some pepper flakes, green onions, or parsley as you mix the dough.